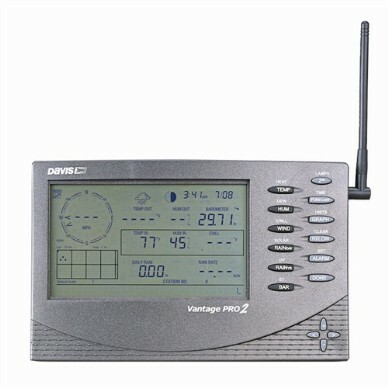 The weather station is comprised of a Davis Instruments Model 6163 fan-aspirated Vantage Pro 2 Plus weather station with wireless connectivity, and UV and solar radiation sensors. The station is mounted on a pole, approximately 12 feet above the ground. 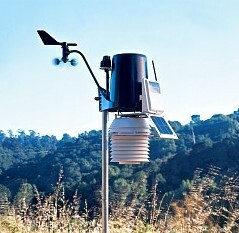 The weather station is the IP version, so the console is connected permanently to the Internet and transmits its data directly to the Davis Instruments Weatherlink network, in addition to our station software (Ambient Weather's Virtual Weather Station). This setup makes it possible for the station to transmit regardless of whether or not our weather station computer is running. The station has been in continuous operation since January 10, 2013.